WHO IS SUPERIOR – BHAGAT OR GURU? With the passage of time Sikhism emerged as a separate religion therefore the term Guru became stronger than Bhagat otherwise Bhagat was always considered as more respectful word than Guru. Bhagat, Guru or Bhagwan the God. Guru is a simple word meaning teacher. Guru teaches technique to reach up to God while bhagat (the one addicted to God) as a term is supposed to close to God. Therefore in spiritual terminology bhagat is a stronger term than the guru. Therefore Bhagat has been a very respectable term. Accordingly the medieval bhagats of Ravidas, Namdev, Kabir, Dhanna and others had always been considered as superior to Guru the teacher. Because I know it is the low people where You shower Your blessings. Thus in Indian society bhagat had a distinct honourable place while guru the teacher has a usual one until the term or post got honour after the Sikh gurus where treated like prophets in Punjab. But this never meant the grade of bhagat was lowered. In the 80s and 90s when there was rebellion of Khalistan the Indian Govt obviously adopted all means to suppress it. One of these was creating divisions in Punjabi society. The Govt explored all possible avenues to promote hatred between the communities in the name of religion and castes. The Govt gave financial support where ever unions/organizations were launched in the name of castes etc. Govt scholars and universities were asked to accomplish this task. Guru Nanak University of Amritsar did played a prominent role along with Panjab and Patiala universities. Cheap scholars naturally were attracted for this dubious researches. I my self remember having heard hatred speech on Doordarshan Jalandhar TV on Feb.8 (year was either 1993/4/5) where the Ravidasia community was being instigated against the mainstream Punjab society. It was being claimed why not status of Guru for Bhagat Ravidas. The preacher was claiming that this is discrimination against the quom. Similarly other communities were being instigated against the Jatts. Second prominent community after the Ravidasias was Ramgarhias while the Tonk Kshatriya and Kabir Panthis did not favourably respond to the Govt's conspiracy. Thus as regards the grade or post the status of Bhagat Kabir, Bhagat Namdev etc. remained same but the Bhagat Ravidas was changed to Guru Ravidas. 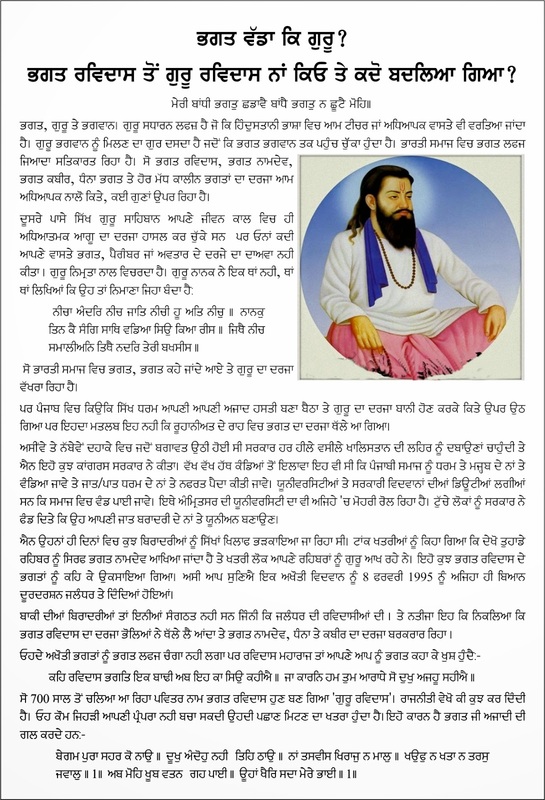 The honourable status of bhagat was changed to Guru the teacher in view of prevalence of seniority of the term in Punjab in view of the Sikh Gurus. It is however different that Bhagat Ravidas was so referred during his life times. God, our King, is father to no one, except those who love Him. The veil of emotional attachment has been cast over the entire world, but it does not bother the God's bhagat the devotee. 3. Says Ravidas, my bhagati the devotion to the One God is increasing; now, who can I tell this to? That which brought me to worship and adore You — I am still suffering that pain. Thus the name which has been current for the past 700 years is changed thanks to the politics. But please let me take the liberty to say that the identity of such a nation who can change its tradition so easily is threatened in future. Begumpura, ‘the city without sorrow’, is the name of the town. There is no suffering or anxiety there. There are no troubles or taxes on commodities there. There is no fear, blemish or downfall there. 1. Now, I have found this most excellent city. There is lasting peace and safety there, O Siblings of Destiny. 1. Pause . God’s Kingdom is steady, stable and eternal. There is no second or third status; all are equal there. That city is populous and eternally famous. Those who live there are wealthy and contented. 2. They stroll about freely, just as they please. They know the Mansion of the Lord’s Presence, and no one blocks their way. Says Ravi Daas, the emancipated shoe-maker: whoever is a citizen there, is a friend of mine. 3.2. This is the Sikhs trying to blame someone else for their Manuwad agenda. They preach equality but practice caste discrimination. The only reason that they are not prepared to refer to Guru Ravidass Ji as a Guru is because they do not believe a chamber can be a Guru, which is exactly the same as the Brahmins thoughts. I would say that Sikh today are the new children of Manu as they practice the same discrimination. An entirely stupid article which throws mud at others for the sick and casteist mindset of many Sikhs. The article explains Khalistani agenda of Sikhs in Punjab who are bent on separating Punjab from India with help from Pakistan and trying to get Ravidassia onboard their struggle for separate homeland. If the writer of this article likes "Bhagat" so much, he should change status of all Sikh gurus to Bhagat like Bhagat Nanak Dev, Bhagat Gobind Singh, Bhagat Arjun Dev etc. The article is nothing but utter nonsesne and reflects sinister mindset of many Sikhs. Ravidass is not Guru, he Satguru and Guru of Bhagat Nanak Dev Ji. Hi anonymous donot speak ill against anyone as author described here that during 80s or 90s the name changed from Bhagat to Guru it was totally done to promote hatered.. I am sure about those days when we used to celebrate Bhagat jis Birthday in village gurdwara jointly by all communities but after 1995 a few people started to celebrate it outside the gurdwara.... after deep investigation it came to know that leaders of same sect donot want to see sikhs and ravidassi on same platform .... We have great respect for Bhagat ravidas ji.... and it cannot be changed by any foul task played by agencies.